Air France has earmarked its Paris Orly Airport-based hybrid carrier Transavia.com to take a larger role in its short/medium-haul network, which necessitates a dramatic shake-up in order to safeguard the sustainability of parent company Air France-KLM. Transavia.com France will launch new routes from its home base at Orly and from three regional French airports – Nantes, Lille-Lesquin and Lyon – as it seeks to defend Air France’s dominant position in these airports against the increasing inroads of LCCs. easyJet has a base at Paris Orly and at Lyon-Saint Exupéry Airport while Europe’s newest LCC, Volotea, opened a base at Nantes Atlantique Airport on 01-Jun-2012 and has announced route expansions from Lille. If Volotea follows up on its stated intentions, its network will inflate to 20 routes from Nantes and bring the capacity share of LCCs at the airport to over 40%. Transavia France was founded in Nov-2006 as an offshoot of the Dutch charter/low-cost carrier Transavia Airlines, a wholly owned subsidiary of KLM, to re-enter the leisure market from France to countries in the Mediterranean basin. Transavia Airlines holds a 40% interest in the French carrier and the remaining 60% is owned by Air France. Transavia France operates under the brand name of transavia.com, with an identical business model, website and image as Transavia Airlines. However, each carrier has its own Air Operator's Certificate (AOC) and management, with Transavia operating out of the Dutch market with its main base at Amsterdam Airport Schiphol and its French affiliate operating from the French market. Both Transavia carriers operate a single class fleet of Boeing 737s. Transavia Airlines deploys 10 737-700s configured with 149 seats and 19 737-800s with 186 seats, according to the carrier’s website. Its French counterpart deploys eight 737-800s at present. Air France KLM’s Transform 2015 restructuring plan anticipates growing the fleet of Transavia France to between 20 and 22 aircraft by 2015/16. When Transavia.com France commenced operations in 2007 it was purposely not positioned as a LCC but as a leisure carrier because Air France management snubbed any kind of association with “low cost”. Seemingly, not much has changed since then. The public statements that outline the new business strategy of Air France Group’s short- and medium-haul activity have no mention of low-cost, no-frills or budget airline and say that “to capture the growth in the 'leisure' sector, Air France has chosen to develop its subsidiary Transavia France which will increase from 2013 the frequency of its existing flights and will operate new routes from Paris-Orly, Lille, Lyon and Nantes”. Air France’s careful wording of its plans for Transavia.com France is likely connected to legitimate concerns that unions, especially pilot unions, will call industrial action in protest of moving towards a LCC and LCC-style work practices. But resisting the reality of the growing popularity of low-cost travel within Europe is short-sighted. 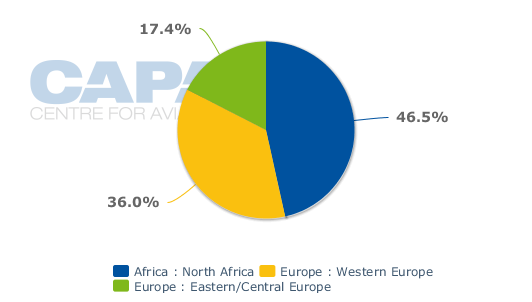 LCCs have about a 42% share of seat capacity within the European Union, and this share is growing consistently, according to OAG data. Five years ago the LCC share was 32%. LCC penetration in France is lower than the EU average, and much lower than in some other European countries with a developed air transport market such as the UK, Spain, Italy, and Germany. 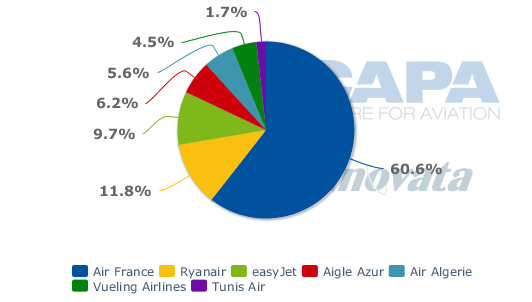 easyJet and Ryanair are France’s second and third largest carriers in terms of passengers carried, according to data of the Direction Générale de l’Aviation Civile. 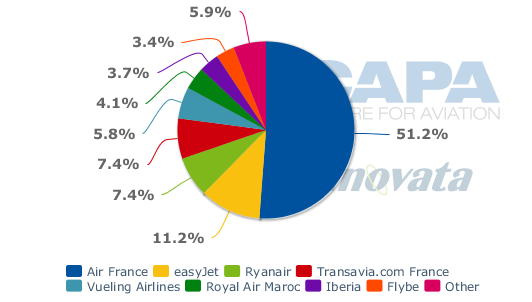 Transavia.com France currently serves 36 destinations, according to Innovata. It deploys approximately 47% of its weekly seat capacity on routes to North Africa, which is typically a strong leisure and ethnic market for France. Currently the carrier does not operate French domestic routes, but that could change as part of its future growth plans. However, Air France chairman and CEO Alexandre de Juniac has stated that “no Air France routes or frequencies will be transferred to Transavia France". The airline’s main base is at Paris Orly Airport. While it is only the sixth largest carrier at Orly in terms of seat capacity with about 36,000 weekly seats, Transavia.com France offers the largest network from Orly. It flies to 33 non-stop passenger destinations from France’s second largest airport, according to Innovata. Several of its routes are seasonal and with a low frequency, such as Dubrovnik. Paris Orly-Dubrovnik commenced 20-Apr-2012 and Transavia France is only serving the route with a single weekly frequency until 28-Aug-2012. Air France is still the largest airline at Paris Orly, offering approximately 335,000 seats per week to 31 destinations. 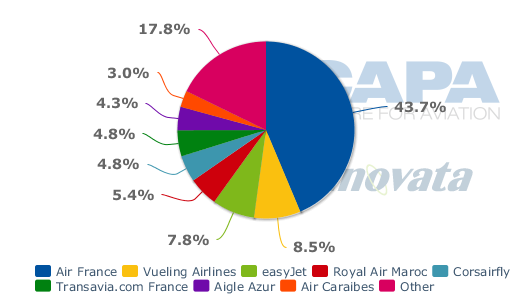 As their networks do not overlap, Air France and Transavia.com together offer a vast network spanning 64 destinations from the airport and they jointly have about a 49% share of weekly seat capacity and a 53% share of flight movements. While this is a comfortable position, LCCs are increasing their footprint at Orly and they have currently about a 24% share of weekly seat capacity. This includes Transavia France; however, the airline offers markedly less seat capacity and fewer flight frequencies than its competitors Vueling and easyJet. The latter has bases at Paris Orly and Paris Charles de Gaulle and has recently opened bases at Nice and Lyon, France’s third and fourth busiest airports. The intent of Mr de Juniac to have Transavia.com France establish a base at Lyon and grow at Paris Orly can be seen as defensive moves protecting the flag carrier’s position against easyJet. easyJet has not made a secret it wants to break Air France’s dominance in its home market. Lyon-Saint Exupéry Airport is France’s second busiest regional airport after Nice. Some 30 scheduled airlines serve the airport and the presence of Transavia.com France is at present limited to two routes and leisure markets – Monastir and Irakleion. Air France is the main operator at the airport, offering about 97,000 weekly seats in but easyJet has based two A319s at the airport and is currently offering almost 42,000 weekly seats. Air France serves 36 non-stop passenger destinations from the airport and easyJet 26. The two carriers compete head-to-head on several domestic and international routes: Barcelona, Bastia, Biarritz, Bordeaux, Brest, Brussels, Milan Malpensa, Nantes, Nice, Prague, Rome Fiumicino, Toulouse, and Venice. Air France would benefit from having an affiliated airline with a markedly lower cost base such as Transavia.com France to increase its competitive clout against easyJet without hurting its bottom line. LCCs currently have about a 21% share of seat capacity at Lyon Airport, but this is likely to increase due to the opening of a new low-cost terminal. Lyon’s new EUR24.4 million Terminal 3 was designed in consultation with easyJet, and increases the airport’s low-cost passenger capacity to three million annually. Nantes Atlantique Airport is another Air France stronghold, but budget carriers are progressively taking a larger market share, with easyJet, Ryanair, Vueling and newcomer Volotea offering a rapidly expanding selection of destinations. 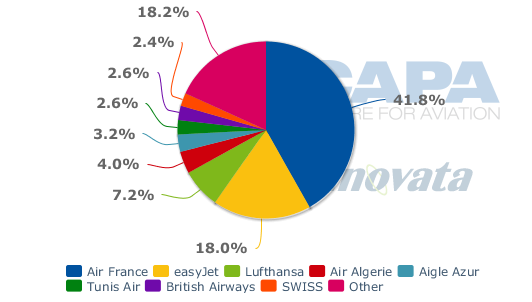 Air France and Transavia France jointly have a near 60% share of weekly seat capacity at Nates, according to Innovata, but Transavia’s share is smaller than easyJet’s. LCCs, including Transavia France, offer approximately 37% of seating capacity at Nantes, well above France's domestic and international average of LCC penetration. The arrival of the new Spanish low-cost carrier Volotea will further increase the presence of budget airlines at the airport. Volotea, which at present operates three 125-seat 717s, opened a base at Nantes on 01-Jun-2012 and intends to expand its offering to 20 destinations (17 are currently loaded in the CRSs but 20 destinations from Nantes are for sale on the Volotea website; several launch dates have been changed since Volotea launched flights from Venice to Nates in Apr-2012). Of the 17 destinations, not one competes with Transavia, which serves 10 destinations from Nantes, according to Innovata. Conversely, six of the new Volotea routes are already operated by Air France: Ajaccio, Bastia, Lille, Milan (Air France flies to Malpensa while Volotea will fly to Milan-Bergamo), Montpellier and Strasbourg. Volotea has announced it will start a daily service to Ajaccio on 01-Aug-2012 (running until 08-Sep-2012), a four times weekly service to Lille and a thrice weekly to Montpellier on 10-Sep-2012, a thrice weekly to Milan-Bergamo beginning 11-Sep-2012 (this service was originally due to commence 01-Jun-2012) and a five times weekly service to Strasbourg. Both Volotea and Transavia France have announced a new twice weekly to Venice Marco Polo Airport in the winter schedule. The route is already served by Vueling. Transavia will also operate a twice weekly service to Berlin Tegel from 21-Dec-2012 until 15-Mar-2012. Mr de Juniac sees also opportunities for Transavia.com France in Lille-Lesquin Airport in the north of France. Lille is mainly a domestic airport, with almost 80% of total seat capacity deployed on domestic routes, according to Innovata. Only eight scheduled airlines operate from/to the airport to 20 destinations, of which 12 in France. Air France is the main operator of the airport, which handled 1.1 million passengers in 2011 and ranks as France’s 13th busiest airport. Air France accounts for about 61% of the weekly seats at the airport while the airline’s share of movements over peak times (between 06:00-09:00 and 16:30-19:30) is about 82%. LCCs presently have a 26% share of the weekly seat capacity at Lille with Ryanair, easyJet and Vueling each serving two routes from Lille. Air France offers 11 routes and competes with easyJet on the latter’s two routes to Nice and Toulouse, with Ryanair to Marseille and with Vueling to Toulouse. Soon, Air France will have to compete with Volotea on an additional two routes, to Nantes and to Bordeaux. The Spanish LCC on 05-Jul-2012 commenced twice weekly flights from Lille to Biarritz, and it will commence a weekly service to Ibiza and a weekly service to Palma de Mallorca on 07-Jul-2012. New thrice weekly service to Nantes will start 10-Sep-2012 followed by thrice weekly flights to Bordeaux commencing on 01-Oct-2012. Transavia.com France currently does not operate from the airport and will launch its first service at Lille, a twice weekly service to Venice Marco Polo, on 20-Dec-2012. It is timely that Air France’s lower cost subsidiary, Transavia.com France will expand at two regional airports that have seen the arrival of Europe’s newest and ambitious LCC, Volotea. Transavia France's planned growth is long overdue. European passengers prefer low fares, and Air France management seemingly has started to accept this. Transavia.com France has no legacy and offers a low-cost growth platform for Air France. But convincing employees – especially pilots and cabin crew – to switch to a “leisure” airline/LCC will be difficult, hence the careful statements of Mr de Juniac. Transavia.com France will expand into regional airports only from 2013. Air France management will need time to negotiate with unions, time the company does not have to improve its poor financial state.